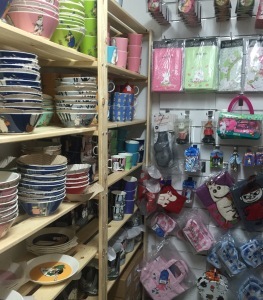 Most of the shops we have previously interviewed in this series on Moomin Product Gallery has been physical shops, but Moomin products are just as popular online. 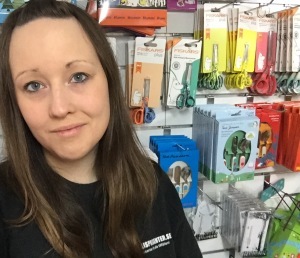 Someone well aware of this is Annelie Wilén who owns not one but TWO webshops selling Moomin products: www.muminboden.se and www.nellispresenter.se. Here she tells us about her life and work with the Moomins and shares her heart-warming choice of who she’d give a free Moomin product to from her store, if she could. Can you tell us a little about Nellispresenter.se/Muminboden.se? The websites www.nellispresenter.se and www.muminboden.se are two gift shops where we focus on personal service and we always want the customer to feel special. Muminboden is completely focused on just Moomin products. 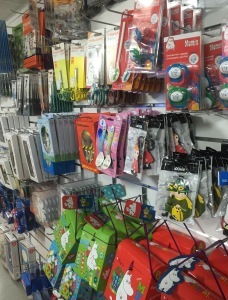 At Nellispresenter we sell other things too, but all Moomin products can be purchased there as well. The range is carefully chosen with the finest products we believe our customers will enjoy. You can also purchase pre-wrapped gifts and cards with handwritten greetings for the person receiving the gift, something many of our customers appreciate. How did the idea for the site originate? Moominboden.se was started by me in 2010. First we only had a rather small assortment of Moomin products, but since then it has grown gradually – and it´s still growing! Why did you choose to focus your site around Moomin products specifically? I thought that there was a void for a niche Moomin Shop when I was looking for Moomin Things on the Internet. What do you think Moomin’s longstanding popularity is due to? Moomin is easy to like. There are so many who have grown up with Moomin and want to pass it on to their children and grandchildren. Then there are many adults who still love Moomin, our Moomin clothes for adults actually sell better than the children’s clothing. A lot of people have asked if our baby Moomin slippers are available for adults. What is your own relationship to the Moomins, are you a Moomin fan or collector yourself? I got my first Arabia Moomin mug for Christmas filled with candy when I was a kid in the ’90s. I liked to watch the Moomin on television and I had some books, but to be honest I was happier for the candy than for the mug itself. The mug became my mom’s favorite mug to drink her coffee from, and she later began collecting them. I received my second Moomin mug when I was already in my twenties and this time I appreciated it and wanted to start collecting them. Partly because the mugs are so amazingly nice, but mainly because I then discovered that the coffee is so much tastier from a Moomin mug. I do not know why that is, but I promise it’s true! Which are your most popular Moomin products? I’d say it’s primarily the Arabia Moomin mugs, tin cans and towels. The most popular character is Little My. If you could give one of your Moomin products to anyone, what product would be and to whom would you give it? That’s a difficult question… There are so many gorgeous things and so many I would like to give them to, but most of all I would like to give all children who are suffering a Moomin stuffed animal to hug.